Grossbritannien Im Maassstabe Von 1:1.500.000. Nordliches Blatt: Schottland U. Der Nordlichste Theil England's. 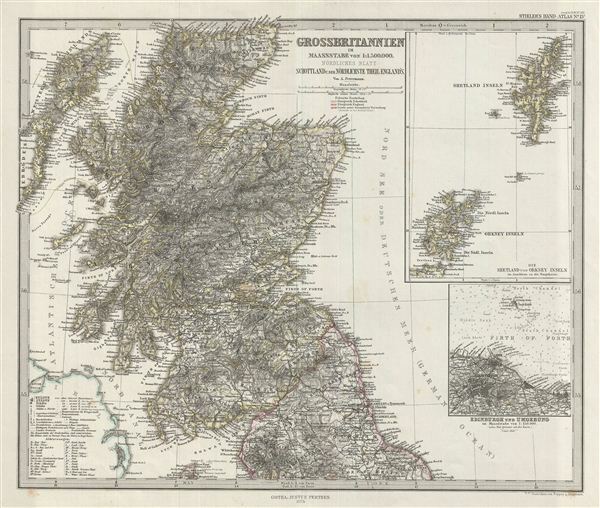 This is a beautiful example of Stieler's 1873 map of Scotland. The map covers Scotland in full from Caithness to Wigtown in the south inclusive of the Hebrides. Two insets along the right margin detail edinburgh and the Shetland and Orkney Islands. Scotland, at this time, was in the midst of the Industrial Revolution and emerging as the center of engineering and shipbuilding for the British Isles. Map is densely detailed with both political and physical data. Various cities, mountains, roads, rivers, islands and an assortment of additional topographical details are noted. Printed to a high production standard, as was typical of German and especially Perthes/Stieler maps of this period. Published by the Justus Perthes firm as plate no. 15c. for issue in the 1873 edition of Stieler's Hand-Atlas.